On April 29, 2016, our community will come together for the Wichita Art Day of Giving (ArtDOG), and we need YOU to join us. It’s 24 hours of unprecedented nonprofit giving—and it’s your chance to make a real difference, right here in Wichita. Last year during ArtDOG, $1.17 million was donated! You can donate to the Wichita Chapter by clicking on the image at the right. All donations are put into the Chapter’s Recital Fund and used to promote the pipe organ and choral music in Wichita. 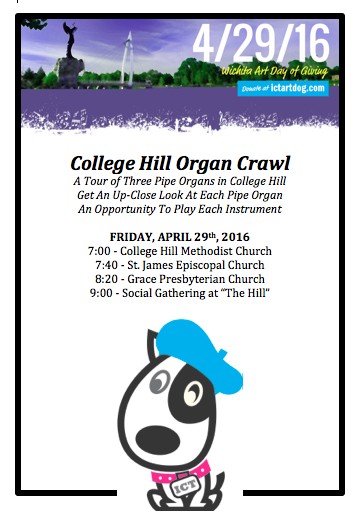 In support of the event, the Chapter will be sponsoring a Pipe Organ Crawl through three instruments in the College Hill area. Each stop will feature a demonstration and give participants the opportunity to play the instrument. Join us for a social gathering at “The Hill” afterwards! We hope to see you Online and at the Crawl!